Interview: FAME director Kelley Abbey and cast. The 1980s Oscar-winning film, TV show, musical and cult phenomenon, Fame , is back. The TV show ran for six seasons, won numerous Emmy Awards and was broadcast in more than 70 countries. The musical ran for a decade on London's West End and new productions are announced around the world every year. Anna Tsekouras talks to renowned choreographer Kelley Abbey and lead cast members about seeing their name up in lights. Truth time, Kelley. Are you super-strict and incite fear into your dancers or are fairly relaxed? Do the cast stand up to attention when they know you're watching in the crowd? They totally do. I'm not someone who leads by intimidation or by yelling or anything, but the kids certainly work hard for me - they're great. I also like to sneak in and not tell them I'm coming just to see what kind of show everyone's doing. You've had a long association with Fame: The Musical ; you played the lead role of Carmen Diaz. Is it hard watching someone else play the role, without giving your own slant to it? I think I've got over that now. I played that role 10 years ago, and they put other Carmen's in after me on the Asian tour. I've also done Fame in South Africa, so I did it with this South African girl. There have been many Carmen's and everyone brings something very individual to the role. So you work with the uniqueness and what they bring to it. It's very different for everyone. Do you have a favourite moment on-stage, one when you really hold your breath? I like when the audience is surprised by something, like Charlie's dancing with the screen - that's a surprise for everyone. I think it's also a surprise for everyone when Miss Sherman strikes Tyrone in English class. I've got so many favourite moments! Another favourite is the tango piece at the beginning of the second act. There's one moment where a girl walks up on stage and they just stop and do a tango pose. Everything just stops and there's a lighting change. It takes my breath away every time. Why do you think people have fallen in love with Fame? It's about dreams and aspirations and that's timeless - that doesn't go away. When I saw the film in 1980, it was a big turning point for me. Seeing the film helped me decide to be a dancer. There's always going to be a kid in the audience that is inspired by a story about performing arts and performing artists. There aren't that many musicals that do that. A Chorus Line does, but there aren't many other musicals that are about the arts and for us it's actually about our world. I think for lots of people, dance is very in vogue at the moment. With shows like, So You Think You Can Dance and Dancing With The Stars , we have an audience that is a lot more dance savvy and dance educated than ever before. And does that make you excited as a choreographer? Yes it does, because you think you've really got to step up and make sure these production numbers really lift off the roof and give people what they're expecting when they're watching them at home. The average Joe Blog knows what a rumba is now, that was never the case before. I've told this story many times, but I was walking up my street when I was working on So You Think You Can Dance , and a construction worker with a hard hat and a jackhammer stopped me and told me how much he enjoyed my Fosse routine. I'd never have ordinarily thought that a construction worker would know who Bob Fosse was - but it's a different audience. So dance is very much in vogue. And when you think of Glee , musicals are much more in vogue. This is one of those musicals that has a contemporary palette, more than most other musicals. You've cast a lot of musicals and once auditioned 4000 hopefuls. Was this audition process just as involved? Yes, I've cast a lot of shows. This was one of the toughest, because some people require four skills. Some people have to sing, dance, act and play an instrument. And then there's the ensemble who can't just be A-grade dancers that sing well. They actually have to step up and cover every principle role, and there are nine principle roles. So, in your ensemble, even though they've got to be A-grade dancers, they've got to be able to sometimes step up and sing, act and play the flute and the keyboard. It was a very thorough and very hard auditioning process, trying to find all those skills in everybody. Was it like an open-call audition? We didn't do open call this time. Ten years ago, we did open call on a show and I saw 4000 dancers for 10 spots. For this performance, we auditioned more like 800-900 rather than thousands. It was an invite, agent-only audition process. What does it come down to that distinguishes one performer from the next? To be cliché, it is the X-factor. Apart from technique and skill in dance, it's just that special something. It's the soul in the person and their edge. But then, you know, sometimes people can be cast by the way they put their dance bag down and walk in to the centre of the room. Sometimes people are cast because you instantly think, "My God, that's the personality of that character." So if that person can dance and sing a G in a chest voice, then that person is really sitting high on the list for that role. Some might look terrific and dance terrific, but if they can't sing a G then that results in a different outcome. But it's definitely an involved process. Some people just skip out and some people get it who don't expect to. What's different about this performance of Fame? It's been rebooted musically from the production we did 10 years ago. It's a brand-new set and it has a brand-new look. I've taken it back to its real rooty New York kind of look. There are no primary colours - it's not High School Musical looking. The fashion at the time was very late 1970s with 1980s beginnings. I think some people's ideas of the 1980s become distorted as fluoro flash tops and hot pink and lime leg warmers, but that was kind of the late 1980s, not the early 1980s. When Fame came out it was very real and rooty looking, and I took it back to that sort of colour palette. The use of the screen and a lot of the music has been re-done and some music is completely new, and the choreography is all new. You've won several awards. Is it important to you to be publicly recognised, so you're then given the creative freedom to select your next project? It's lovely to be recognised, especially by your peers. I won the Helpmann for this just recently. That's all great, but also you can't define yourself by whether you won the award or not. And you can't define yourself by how things were critiqued by journalists because, at the end of the day, all of it, even the awards is just a group of people's opinions. I don't define myself by the positive or the negative, I just do what I feel is right and what I'm meant to be doing. I think that's what you've got to do because you've got to keep your head level and to be able to be buoyant to go through when things don't work and when they do work. You've just got to keep perspective on it. When I'm not working? That's not very often, to be honest (laughs). I go to the park, I like nature and I like to paint and draw. And sometimes if I'm over, over, over working, I just like to lie and look at the wall. I just think, "Please, can the world stop for a second!" But nature's good and painting is good - they're the things that me calm down. Bob Fosse. I'm such a big fan. Stylistically, he's ahead of his time. He's very innovative and is doing what nobody else is doing. A performer that became a choreographer that became a director. If I could ever be half as good as I think he is, I'd be very blessed. I've written two shows that are sitting on the shelf. So the next thing for me is probably not do someone else's show, but to do my own. I'd have to say my opening night when I played Charity in Sweet Charity . My opening night of that show and the entire experience was amazing. It was one of those roles where you never leave the stage. I'll never forget the end of that and me holding a big bunch of flowers and seeing the audience. I was high as a kite. There's so many! I love Stevie Wonder. I learnt to dance to Stevie Wonder. So whenever Stevie's on I always dance. My favourite thing at the moment would have to be this beautiful turquoise, Mexican top. It's hand-woven, beaded and it's beautiful. Probably being younger and not being able to say no, and getting older and learning how to say no. What's it been like starring in a popular show? Talia: It's a very close-knit cast so we have a lot of fun on-stage and offstage as well. It has a really good positive vibe and it's a fun show, we kind of just get to rock it out on-stage. Talia: We are all like bouncing up and down. Chris: Yeah, it's really exciting! What's it been like working with choreographer Kelley Abbey again, Talia? Talia: She's the type of person that as soon as you work into the room she'll say, "How are you?" So she really cares about how you are mentally as opposed to what you're just going to do for the show. She commands so much respect from us without even trying, we all want to give her 120 per cent and impress her and make her proud of what we are doing. Chris: And generally because I play a more senior acting role in the show, it's great to watch how Kelley gets the best from her dancers in rehearsals. She's amazing. I love how she inspires the dancers by showing them how to do a move the right way and then bam - they just go to another level! How can you tell if she's thinking that you're not putting in 110 per cent? Talia: Oh she will tell you, she won't beat around the bush. She'll basically say, "Look that wasn't up to scratch, that wasn't as good as last time, let's improve it this way." Or just a disapproving look is enough. Chris: She talks a lot about our cast being quite "wild" - so we always have a lot of energy. But it's not always focused in the way that Kelley wants it � so that's something she always comes back to � refocusing us and the energy, in the right way. Talia: I also think because she's so respected in the industry. She's one of the top people to work with at the moment and for a lot of us - especially the dancers - that was one of the major draw cards of the show - to work with Kelley. Internationally, she is at a very high standard for choreography and just for everything she is doing to commercialise dance and get it out to the public through shows like So You Think You Can Dance (SYTYCD), and new projects. She is always going to be involved in the future of dance so it is a good thing just to be in her good books. Talia, did you walk into the auditions thinking you were a shoo-in because you had done SYTYCD? Talia: No I'm so bad with that. I'm almost the opposite because I freak out about auditioning and who is auditioning and I work so hard at making sure I'm better than them. I was renting out studios to practice my ballet routine and not leaving anything to chance. Once I've kind of decided I want something I need to get it. So I'll just do anything to get it. I knew this show was musical theatre and wasn't anything I'd trained in before so I knew that everyone else had something over me and I had to beat them. So yeah I'm a bit competitive in that way (laughs). What's the standout moment in the show? Chris: To be honest it's a couple of the moments that Kelley's completely re-worked for the new production. Like the start of the second act, the tango number or dancing on the sidewalk. I remember in the rehearsal room I'd just cry watching the dancers do what they do because it was so amazing and intense. My mate Sam and I were just looking at each other crying (laughs). Talia: My favourite moment I get to do is my plié. That is the one thing in the show that I can't wait to do every single time because I stare down one person in the audience as I do it. You're both using so many skills all at the same time, including singing and dancing and acting. What's the biggest challenge? Chris: The biggest challenge in this industry is just finding that consistency. Doing eight shows a week, every week is challenging. It's strange to know that you're whole business relies on your body, and you know that your voice or your body is cracking because you don't eat or you don't sleep well or you drink too much or whatever then you know you can't work. Sometimes I just wish I could sit in front of the computer with a headache instead of thinking, "I've got to make magic and smile at the audience." Talia: For me it's about not sitting into the show. I make sure outside of the show I do quite a few hours of training because if I just do the show I'm doing the same choreography eight days a week, and that's when injuries start to happen because you are doing the exact same thing. So it's important to cross-train and have something else for my brain to concentrate on. That's what also keeps the show fresh. What is your first love? Is it still dance or have you discovered this new love of acting? Talia: Definitely dance. That's what I know I'm good at. But acting is definitely fun. I've been trained in TV acting but theatre acting is really different. You kind of have to over dramatise so the back of the audience can actually see what you're doing so I definitely enjoy that. It's quite similar to dance in that way, which is all about telling a story, whether it's ballet, where you don't actually speak a word or if it's contemporary. These days there are even vocalised dance performances, so it always intertwines. Chris: I fell into this industry quite late when I found my voice around 17. So music was my first love but now it's sort of swinging more towards the acting. Sometimes with a lot of music theatre as we all know, quite a lot of the plot line is quite shallow (laughs), so I'm loving getting more into the sort of straight acting and deeper stuff. At the same time though, I find that in even sort of points of my life when I've been emotional or depressed or something there is something about singing that really gets that out of your body, which is a good thing. Did you both watch the original movie and do some research about what you should bring to the show? Talia: I think it's important to research a storyline like that, but it's also important to bring some yourself to the character, because Kelley - whoever she chooses for the roles - she obviously saw that character in that person. That's the only reason why you get that role. Talia: For me, I still have so much passion for straight classical ballet. Obviously, still with a bit of an edge, but when I'm just buckling down 12 hours of training a day that's what makes me really happy so I'm heading overseas to go and do that. I'm heading to the US, mainly San Francisco and New York. I just want to come back after a few years and be a whole different dancer - I want to take it to the next level. Chris: For me I want to win the Green Card and move to New York tomorrow. I want to pursue more film and TV work here, and make that transition from the young pretty boy roles into something grittier, I guess. Chris: "Fix You" by Coldplay. Talia: (laughs) At the moment, I'm listening to a song that one of the dancers plays to all the time it's called "Bit You Better" - anything ghetto! Chris: Honesty. Always be honest on-stage, offstage, whenever. Talia: Winning SYTYCD! That was pretty good. Chris: Um I don't know (laughs). Talia: (Directed at Chris) Something about being gorgeous? Talia: Definitely the confetti coming down on SYTYCD. Chris: For me it is performing briefly at Steve Irwin's memorial service. 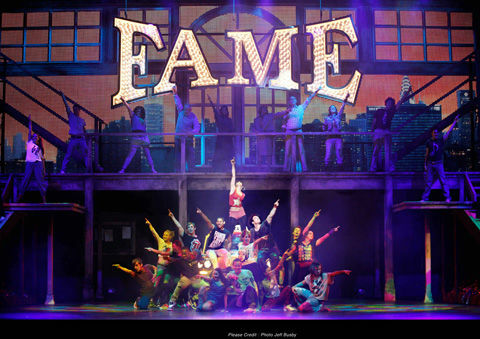 Fame is on now at the Capitol Theatre, Sydney. Visit www.capitoltheatre.com.au .